Old coloured celestial map. Printed in Amsterdam by Valk & Schenk in 1708. Old coloured celestial map. Printed circa 1750. Decorative map of the surface of the moon in two hemispheres. Surrounded by small illustrations of the lunar eclipse. 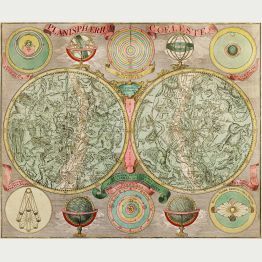 Old coloured celestial map. Printed in Nuremberg by J. B. Homann circa 1730. Old coloured map of California as an Island. Printed in Nuremberg by J.B. Homann circa 1720. Old coloured title page. Printed in Amsterdam by Valk & Schenk in 1708. Exceptionally rare star map of the northern sky. Most likely printed in Vienna before 1569. Two separate charts of southern and northern Hemisphere according to Philippe de la Hire (1640-1714). Hemisphere with surround of text and engraved dedication to Jean Paul Bignon from Herman van Loon. Coloured celestial map. Printed in Paris in the year 1705. Old coloured celestial map. Printed in Nuremberg by J. B. Homann in 1742. Engraving of the solar system with comets. Published by E. Bowen in London in 1747. Hand coloured copper engraving from J.G. Doppelmaier by J.B. Homann, showing orbit of the planets. Doppelmaier's map of the orbit of the planets. Published in Nuremberg by J. B. Homann in 1746. Copper engraved map of the solar system after Schatz by Homann Erben. Showing the round solar system with globe, compass rose and an armillary sphere. Dated 1753. Antique celestial map. Printed in Nuremberg in the year 1753. Hand coloured copper engraving from T. Mayer by Homann Heirs, showing the lunar eclipse of August 1748. With the coloured moon and hemisphere.